You don’t have to be a mechanic to figure out what size tire your car needs. You can order the right size tire once you learn to read the numbers and letters on the sidewall of your tires. In fact, learning how to decipher those mysterious markings can help you correctly identify which tires you need when it comes time to replace them, and can help you shop around online to get the best deal. If you’re calling around to find out who carries the tires you need and where the best prices are, you’ll be glad you learned how to read a tire sidewall. Let’s dive into the world of sidewall codes. Once you know the code, that long string of letters and numbers will make perfect sense. Let’s say your tire is stamped with a code that says P205/65R, a common designation. The first letter in that sequence tells you what type of vehicle the tire is meant for. 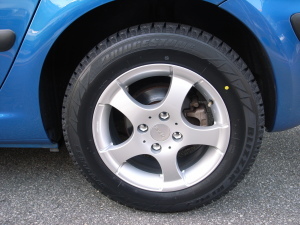 In this case, the tire is for a passenger vehicle (“P” for “passenger”). You might also see “LT” for “light truck.” If you don’t see a letter at the beginning, this means that the tire is meant for European vehicles, some sport utilities, and vans. The “205” in our code refers to the section width of the tire measured in millimeters from sidewall to sidewall across the tread of the tire. Moving along, you’ll next see the aspect ratio of the tire, which, in our example, is 65. This number refers to the height of the sidewall when you measure from rim to tread (the area of the tire more commonly known as the “profile”) as a ratio of the section width. The profile height here is 65% of the 205 mm we read earlier. The higher the number here, the bigger the aspect ratio, or profile and the taller the tire. Keeping your tires at the right pressure is important for maximizing the life of the tire as well as your gas mileage. The inflation guideline you see on your tire’s sidewall gives you the maximum cold inflation pressure; but this number, measured in pounds per square inch, or psi, is generic for the tire and not for the tire on your particular vehicle. You want to know how much air to put in your tire based on what your vehicle weighs, so you can use this number as a very general guideline only. Instead, check your car’s owner’s manual or the placard label usually found inside the driver’s door jamb. Using the right tires at the correct pressure will greatly increase your safety and driving comfort. For cars that just aren’t worth fussing over anymore, sell them for cash at Messy Motors. Just pick up the phone and contact Messy Motors at (888) 408-9636. We’ll give you an instant quote on buying your car.